In January 2015, the California Native Plant Society (CNPS) celebrated its 50th anniversary by holding a gigantic conference. About 700-1,000 people attended. There were several hundred short presentations and many posters describing research and “restoration” projects. The abstracts of these presentations are available on the CNPS website. We are publishing a brief description of a few of the presentations sent to us by one of our readers who attended the conference. We publish with permission but without attribution, on request. We have added a few edits in brackets and italics as well as a few links to relevant articles on Million Trees. I was very impressed with the quality of the presentations at the CNPS conference. Some were given by academic scientists or their graduate students. Many were given by land managers and managers of “restoration” projects. There were about 225 presentations in 5 simultaneous sessions, so it was possible to hear only about 45 of them. There were also many short “lightning” presentations and nearly 50 posters. Please consider this an impression of the conference, rather than a comprehensive report. Michael Soulé was the opening speaker. You might recognize his name as one of the proponents of invasion biology who is angry about growing acceptance of “novel ecosystems” and the ecological functions they perform. [Million Trees has posted articles about this debate among academic scientists. Soulé is one of the invasion biologists who demanded that the Nature Conservancy abandon their support for novel ecosystems.] His objection to any acceptance of non-native plants was the main focus of his presentation. He closed by saying that he “cannot live” without wild nature. Since his definition of “nature” seems to exclude non-native plants, one wonders how he will manage to survive. Perhaps he lives in an alternate universe populated solely by native plants. Jared Farmer was the speaker at the conference dinner. His subject was the history of eucalyptus in California. His presentation was similar to his treatment of the subject in his book, Trees in Paradise. 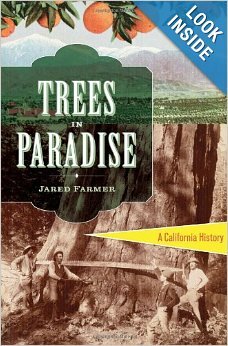 [Million Trees has posted articles about Farmer’s book.] Like his book, his presentation was even-handed in its treatment of eucalyptus. That enraged the audience, which booed every time he said something positive about eucalyptus. One wonders why he was invited to speak to this audience. Were the organizers of the conference interested in promoting a more balanced view of eucalyptus? Or did they just want a provocative speaker to wake up a sleepy audience after hours of a fund-raising auction? Many of the presentations were surprisingly frank about the difficulties experienced by “restoration” projects. CNPS deserves credit for inviting speakers who described some stunning failures of their effort to “restore” native landscapes. I’ll describe just a few of the themes of speakers I heard. I was surprised to learn that San Francisco’s Public Utilities Commission (PUC) is heavily engaged in native plant “restorations.” The PUC is responsible for managing thousands of acres of open space in the watershed that supplies San Francisco’s drinking water. Common sense suggests that the PUC’s top priority would be the purity and safety of the water supply. The PUC presentations at the conference suggest otherwise. The PUC’s commitment to native plant “restorations” seems to trump the goal of clean water. The PUC attempted to “restore” 100 acres of wetland and riparian habitat in San Mateo, Alameda, and Santa Clara counties by planting over 500,000 native plants, obtained from several different nurseries. They claim to have followed a strict protocol which theoretically should have prevented the introduction of diseased plants. Their protocol obviously failed. The fact that many of the plants were infected with Phytophthora was not discovered until they were planted in the ground. Phytophthora is the pathogen that is causing Sudden Oak Death. The PUC is now faced with the difficult—if not impossible—task of trying to contain the spread of a fatal pathogen for which there is no known cure. This project was funded by a “mitigation” grant for capital projects elsewhere in San Francisco. Environmental laws require the builders of new development to “mitigate” for the impact they have on the environment by funding projects elsewhere, which are considered beneficial to the environment. This often looks like legalized extortion to me. It also increases the cost of infrastructure improvements, which limits the number of improvements we can make. In this case, there clearly was no benefit to the environment. It was both money down the drain and a poke in the environment’s eye. As pointless as that project seemed, the other project presented by the PUC seemed even more pointless. 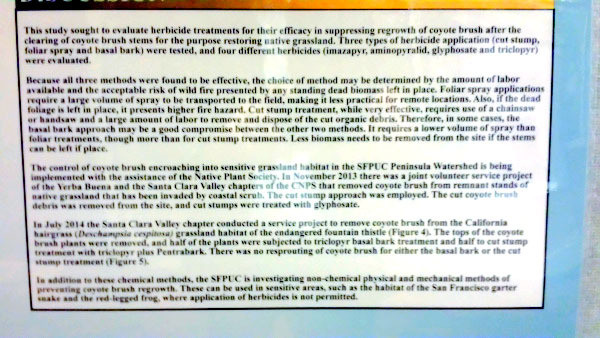 They presented a poster describing an experiment intended to determine the most effective application method and type of herbicide to eradicate coyote brush. They used several different methods and types of herbicide, including Garlon (triclopyr) [which is known to be very toxic to aquatic life] and Milestone (aminopyralid) [which is banned in the State of New York because it is persistent and very mobile in the soil]. As you know, coyote brush is a native plant, so one wonders why it was necessary to eradicate it. According to PUC’s poster, it’s another example of trying to prevent natural succession from grassland to scrub. You might ask why the PUC is obligated to maintain grassland? You might also ask how the PUC can justify using toxic herbicides in our watershed? I can’t answer those questions. It doesn’t make sense to me. 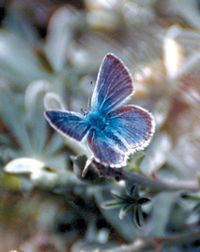 There was also a discouraging presentation by the folks who have been engaged in the effort to “restore” San Bruno Mountain in order to preserve and maintain a population of several species of rare butterflies, including the endangered Mission Blue butterfly. This project officially began 32 years ago when the Habitat Conservation Plan was created by federal environmental protection laws. The goal was to restore native grassland required by the rare butterflies. The speaker said this goal remains largely unfulfilled. As for the butterflies, their current status is largely unknown because monitoring efforts are not sufficient to determine the size of the population. It’s seems almost comic that when all is said and done, the main threat to native grassland “restoration” is apparently a native plant that is just doing what comes naturally…”invading” grassland in the absence of fire or grazing. Dieteria canescens variety canescens, native to Wyoming. Photo by Stephen Perry. I also attended the presentation of a native plant advocate from Mammoth Lake, on the eastern side of the Sierras. She is engaged in a futile crusade to prevent the hybridization of a new plant, which she considers non-native, with a closely related native plant. When this new plant arrived in her neighborhood, she recognized that it was different, but she was unable to identify it. It wasn’t easy to find someone who could identify it. Eventually, she found a botanist in Wyoming (where it is native) who was able to tell her that the new plant is a variety of a plant that is native at Mammoth Lake. 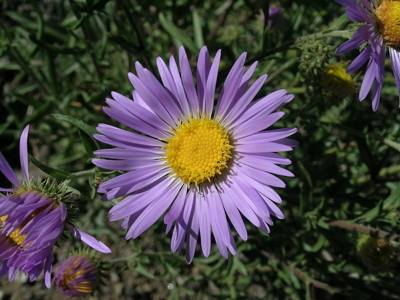 These plants are in the aster family. The native is Dieteria canescens. The new plant considered a non-native invader is Dieteria canescens var. canescens. In other words, they are the same species! From a horticultural standpoint, the new plant is superior to the native in every way: it is a bigger plant with more flowers; the flowers are bigger with more rays; the flowers are a deeper color. So, why must it be eradicated? 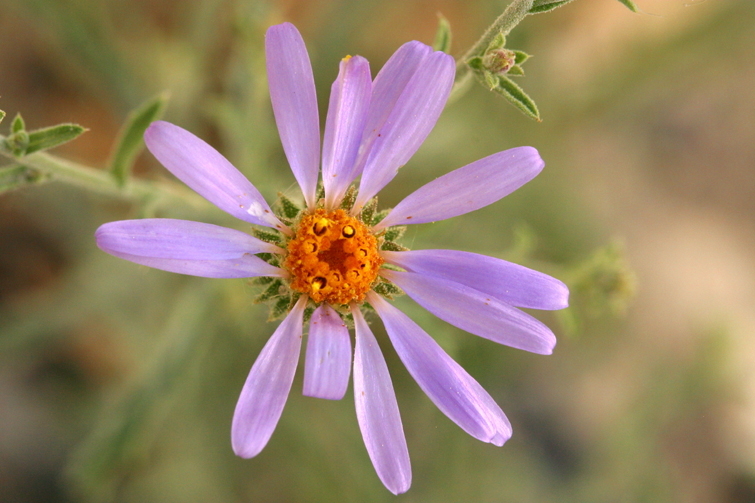 Because native plant advocates fear that it will hybridize with the native aster and “swamp” it genetically, i.e., wipe it out. Would that be such a terrible thing? That is a matter of opinion. One person in the audience asked why the new plant was not being accepted as an adaptation to climate change that would probably increase the likelihood of the survival of the species. The speaker’s answer was that she could not accept the loss of the variety she considers native. Another person in the audience asked this rhetorical question: “What is our narrative here? How can we expect the public to understand that it is necessary to eradicate a plant that is the same species?” The speaker agreed that it is not an easy sell. I was encouraged by these questions. They seem to be a glimmer of common sense. I hope they are prophetic of the future of the native plant movement. On that happy note, I close with an invitation to visit the CNPS website to read the abstracts of the hundreds of posters and presentations at this excellent conference. “Assessment of the past 30 years of habitat management and covered species monitoring efforts associated with the San Bruno Mountain Habitat Conservation Plan (Draft),” Creekside Science, October 21, 2014. Very good questions on the aster. Nature is too complicated and not easily understood as it adapts. Climate change has affected much plant and wildlife and there is nothing humans will be able to do about what will be living where in time. With respect to grasslands and the coyote bush, grasslands are the most endangered ecosystems in the world just about everywhere in the world, and conservationists are making a special effort to save them. Yes, shrubs will encroach in the absence of fire and grazing, but you have to ask yourself why there is an absence of fire and grazing. If these conditions are human-caused, then humans can do something about reversing or mitigating for them, either by re-introducing grazing and fire, or by mimicking their effects. Webmaster: Actually, the grassland which was the predominate landscape in the Bay Area was “human-caused.” As we reported in two recent posts (about “Tending the Wild”), Native Americans prevented natural succession from grassland to shrubs for thousands of years prior to the arrival of Europeans. Because native plant advocates have arbitrarily selected 1769 as the specific landscape to replicate in their “restorations,” they have selected the landscape that was created by Native Americans. 1769 was the date when Europeans saw the San Francisco Bay Area for the first time. Secondly, San Francisco is the second most densely populated city in the United States. It is therefore not a place where we can safely conduct prescribed burns every year to prevent succession. Nor is it a place where we can graze cattle. We also do not have the option of reintroducing the ungulates which grazed the grasses prior to the introduction of domestic animals because we can’t reintroduce the top predators that would balance a population of grazing wild animals. In the absence of top predators, a population of wild animals would quickly expand and destroy whatever vegetation you believe we must preserve. Once again, Patsy, you seem to bring a standard that is perhaps appropriate to Alberta, Canada that is not appropriate to a densely populated area such as the San Francisco Bay Area, where 9 million people live. No one here is volunteering to commit suicide so that native plant advocates can restore grassland. The objective of conservation is to maintain natural biodiversity, which involves setting back succession in various instances where without the influence of man it would be set back by nature. Hybridization is a more difficult question, because it happens frequently in nature and can lead to the production of new species, i.e. an increase in biodiversity. But sometimes the barriers to hybridization, such as distance, mountain ranges, etc., are broken down by man, such as roads, travel, and “unnatural” hybridization occurs, with the genetic swamping of the original local species or subspecies. In the case of Dieteria, I think it constitutes an interesting natural experiment to see what in fact will happen, whether the invading variety will in fact be the more aggressive plant, and yes, I agree that in some instances thwarting the course of events may not be worth the effort. I see a solution to the Dieteria canescens vs Dieteria canescens var. canescens: declare them to be distinct but closely related species (a simple task, look for a few genetic differences). Then the problem of varieties and confusion in the minds of the public will disappear. Next, fill up the herbicide tanks and annihilate the invader. This is not as far fetched as it sounds. I saw a population of a rare Botrychium fern wiped out because even though it looked every bit like the rare species was declared by an expert not be since the population was not hexaploid. Problem solved and the pipeline went through. Ploidy levels are variable in plants even those in the same morpho-species such as yarrow, buttercups and others. For all anyone knew this fern population was a newly discovered species, a micro-speceis. We’ll never know now. Oh dear, what a terrible story. These decisions often seem so arbitrary and sometimes there seem to be ulterior motives. It’s all so tiresome! Still there is some hope that this fern exists nearby the destroyed site but it has been many years since I’ve been able to go back. Maybe this summer for sure. In my area there is a lot of talk and action to restore wetlands along the St. Louis River. This involves digging up fill (Some of which is contaminated. Wonder what lucky rural towns will get that?) and planting native species. never mind that at at several of these sites native wetland plants have successfully colonized the land wrecked in the late 1880’s and early 1900’s. Herbicides are part of the mix to control invasive plants. and Oaks on our Australian farm . They are both venerable, beautiful trees. You will be rewarded. Know that the redwood will require a lot of water, particularly when it is young. They like fog, but they don’t like wind. But surely you know these things, because you are a successful steward of your land. I was at the conference, and heard Jared Farmer’s talk on eucalyptus. The author is dead wrong about the audience being “enraged”. During his presentation, there were a few scattered and isolated groans – but the round of warm applause that Farmer received at the end showed that the audience as a whole approved his overall message. I can’t say why Farmer was invited – but his presentation would have been ideal for a mixed audience of pro and anti-eucalyptus citizens, and would have helped set the mood and factual basis for a productive dialog between them. I, too, attended the CNPS conference. Jared Farmer was warmly received, before he started talking. He got a welcoming round of applause when he was introduced. But when he said non-demonizing things about eucalyptus he got gasps of disbelief, groans, and boos. Yes, boos. Also laughter. He was not put off by any of the response; he knew who he was talking to, and had heard it all before. When he finished there was also applause, but significantly lighter than before he began. Most people were civil and polite; that doesn’t translate into “approved his overall message.” I walked out of the ballroom next to a woman who was fuming and sputtering, “What was that? Was that art? What was he doing here?” She was, in fact, enraged. The hostile reaction to the few things Farmer said that sounded tolerant of eucalyptus was remarkable. He is in no way “pro-eucalyptus,” and repeats a lot of the anti-eucalyptus mantra as if it were true. But true believers demand 100% purity. Follows is a conversation with Andy Blick about the latest moves by the compliance agents of a state that promotes wide-scale whole ecosystem poisoning as a conservation tool. I have already been interviewed , a month or two ago by two detectives, but there was no request to examine my computer, take DNA or prints. Exactly Bill, I wont be giving them anything if they visit. People shouldnt, as stated there are important freedoms and privacy rights at stake here.. You can, in fact, at any stage after giving a sample change your mind and it must be destroyed. Whether it is or not is another thing.Also people are saying ;oh the policeman was very friendly and doesnt like 1080 either. Course he doesnt how else is he going to get you to comply, by using standover tactics? These people are trained in getting compliance. Way too clever for most of us. Also he represents the same system that owns and applies the 1080. Another take on it for me is; my DNA is not mine to give. I was gifted it by my parents and I have passed it on to my kids. It belongs to them. Cause once they have one persons DNA they have everyone that persons related to. Thanks for passing that on.